Jazz up your holiday spread and make every party an exciting and joyous one with a bottle of Non-Alcoholic May 100% Sparkling Grape Juice. Whether it’s a big gathering or a party of two, no celebration is ever complete without a sparkling juice! May 100% Sparkling Grape Juice is a magnificent party-starter as it can be enjoyed by everyone to celebrate Christmas with a delicious gourmet meal as everyone snuggles by the Christmas tree and liven up the holiday spirit. 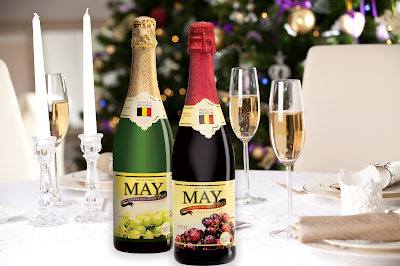 May 100% Sparkling Grape Juice is truly delightful to taste, radiating fresh and fruity flavors of Belgium’s finest and carefully selected grapes. It has no added sugar and preservatives so everyone is invited to savor the sweet taste of the grapes without guilt! This way, no one will be left out as you toast to Christmas with this wholesome, non-alcoholic sparkle that also happens to be delicious. Whether it’s a refresher for warm lunch gatherings or something that you can take to your picnics, a bottle of May Sparkling is all it takes to bring joy to the occasion. As a versatile drink, you can also incorporate May Sparkling Grape Juice into handcrafted mocktails! Everyone loves its flexible taste that’s guaranteed to keep the good times rolling. So who says you need booze to provide the satisfying feeling of fizz and effervescence? With its spice-tinged flavor that’s made with no artificial flavors, colors, or preservatives, your non-alcoholic drink is guaranteed a hit. If you are looking for a Christmas gift that is fantastic but practical, May 100% Sparkling Grape Juice is a great choice! As a wholesome thirst-quencher, adding this to your Christmas gift baskets will surely make your family and friends truly grateful. Each serving of May reflects your every joie de vivre – the joy of being with family, the joy of seeing old friends, the joy of celebrating the season. Spread the cheer, add a festive Christmas spirit to every home, and say yes to a sparkling Christmas with May 100% Sparkling Grape Juice.